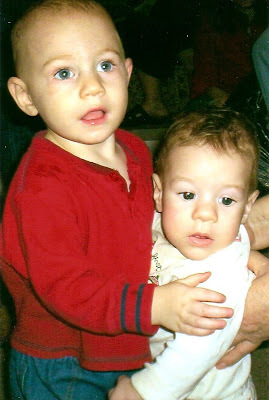 This is a picture of my little one Hunter and his cousin Joshua. Joshua is on the right side of the picture. Aren't they cute hugging? You probably don't remember but Josh was born about 2 months early. When they took him to the doctor last week, she said she thought he may have a slight case of cerebral palsy. Sometimes he will ball up his fists like he wants to punch you. Apparently she thinks he does this too often and may have a problem. They are going to take him to a different city for a second opinion. Hopefully another doctor will have a different diagnosis. He's about 9 months old now. I thought they could tell about that before now, but I don't really know a lot about it. If you don't mind, say a prayer for Josh and his mom and dad. They are really worried right now. Thanks! So sorry, your family is in our prayers. I will keep Josh and his parents in my prayers. Thank you for sharing. Of course I'll say prayers for Josh and the family !! Goodness! I'll be glad to pray for them. I sure will be praying, Nancy. My Colton was diagnosed at 10 months old and it took an MRI to confirm his diagnosis. I will have Joshua and his family in my thoughts and prayers. I hope the second dr. has better news. Joshua and Hunter are both cutie pies! You have mine....thinking of Joshua and his family! Bless his little heart... I'm praying for a miracle! I've been keeping Joshua in my prayers; sorry if I've missed an update (I'm so far behind) I hope they have some answers.